The effect of industrialisation shown by rising income levels in the 19th century. 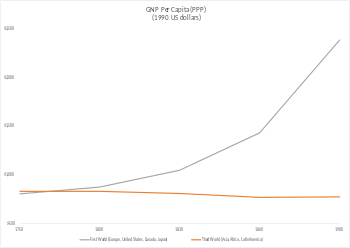 The graph is showing that the gross national product (at purchasing power parity) per capita between 1750 and 1900 in 1990 US dollars for First World nations (Europe, United States, Canada, Japan) and Third World nations (Asia, Africa, Latin America). Industrialisation is the period of social and economic change that transforms a human group from an agrarian society into an industrial society, involving the extensive re-organisation of an economy for the purpose of manufacturing. The first transformation from an agricultural to an industrial economy is known as the Industrial Revolution and took place from the mid-18th to early 19th century in certain areas in Europe and North America; starting in Great Britain, followed by Belgium, Switzerland, Germany, and France. Characteristics of this early industrialisation were technological progress, a shift from rural work to industrial labor, financial investments in new industrial structure, and early developments in class consciousness and theories related to this. Later commentators have called this the First Industrial Revolution. As the Industrial Revolution was a shift from the agrarian society, people migrated from villages in search of jobs to places where factories were established. This shifting of rural people led to urbanisation and increase in the population of towns. The concentration of labour in factories has increased urbanisation and the size of settlements, to serve and house the factory workers. Industrial Workers have to either leave their families or bring them along to work in the towns and cities where these industries were found. Family structure changes with industrialisation. Sociologist Talcott Parsons noted that in pre-industrial societies there is an extended family structure spanning many generations who probably remained in the same location for generations. In industrialised societies the nuclear family, consisting of only parents and their growing children, predominates. Families and children reaching adulthood are more mobile and tend to relocate to where jobs exist. Extended family bonds become more tenuous. As of 2018[update] the "international development community" (World Bank, Organisation for Economic Co-Operation and Development (OECD), many United Nations departments, and some[which?] other organisations) endorses development policies like water purification or primary education and co-operation amongst third world communities. 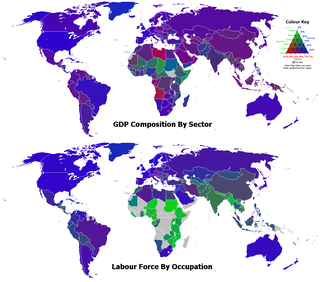 Some members of the economic communities do not consider contemporary industrialisation policies as being adequate to the global south (Third World countries) or beneficial in the longer term, with the perception that they may only create inefficient local industries unable to compete in the free-trade dominated political order which industrialisation has fostered. Environmentalism and Green politics may represent more visceral reactions to industrial growth. Nevertheless, repeated examples in history of apparently successful industrialisation (Britain, Soviet Union, South Korea, China, etc.) may make conventional industrialisation seem like an attractive or even natural path forward, especially as populations grow, consumerist expectations rise and agricultural opportunities diminish. ^ Pollard, Sidney: Peaceful Conquest.The Industrialisation of Europe 1760–1970, Oxford 1981. ^ Buchheim, Christoph: Industrielle Revolutionen. Langfristige Wirtschaftsentwicklung in Großbritannien, Europa und in Übersee, München 1994, S. 11-104. ^ Jones, Eric: The European Miracle: Environments, Economics and Geopolitics in the History of Europe and Asia, 3. ed. Cambridge 2003. ^ Henning, Friedrich-Wilhelm: Die Industrialisierung in Deutschland 1800 bis 1914, 9. Aufl., Paderborn/München/Wien/Zürich 1995, S. 15-279. ^ Cite error: The named reference springer.com was invoked but never defined (see the help page). ^ Lewis F. Abbott, Theories Of Industrial Modernisation & Enterprise Development: A Review, ISM/Google Books, revised 2nd edition, 2003. ISBN 978-0-906321-26-3. ^ The effect of industrialisation on the family, Talcott Parsons, the isolated nuclear family[dead link] Black's Academy. Educational Database. Accessed April 2008. ^ United Nations Millennium Development Goals. Un.org (2008-05-20). Retrieved on 2013-07-29.